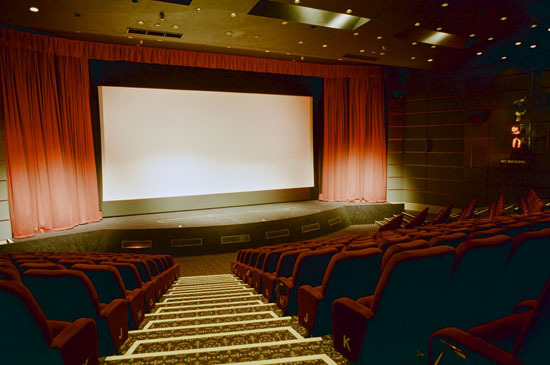 In West Yorkshire, in the heart of Britain, one of the worlds most advanced cinemas is situated. Capable of presenting not only 35mm and 70mm, but also Cinerama. There are two additional 3-strip cinemas, but they are private. (The New Neon in Dayton, USA has added a Cinerama installation in 1996). Originally there were more than 150 3-strip installations scattered all over the globe. 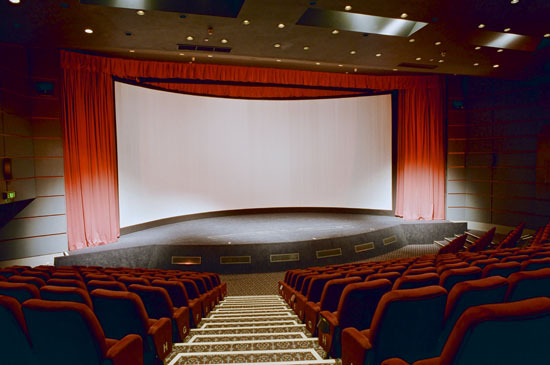 Pictureville Cinema, with its unique screen and sound technology, can display 3 Cinerama projectors and one 35mm/70mm projector. With this collection of equipment, only very few films cannot be shown there. Pictureville cinema opened April 8, 1992 (1st Cinerama performance: June 16, 1993) with a charity performance of "Hook" in 70mm and 6- channel stereophonic sound. For more than a year Pictureville ran 35mm and 70mm on the flat screen. Many 70mm films from the collection of the museum, like "STAR! ", "Custer Of The West", "The Last Valley" and many others, are frequent guests on the 70mm screen. 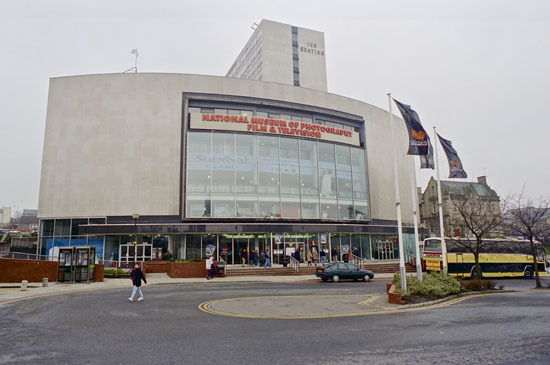 Pictureville Cinema is managed by National Museum of Photography, Film and Television in Bradford (NMPFT). The cinema itself is located inside an old theatre building. The entrance is left of the NMPFT. Once inside you are greeted by friendly staff and a large pin board with clippings from the films shown in the Pictureville Cinema. There is a bar behind the projection. An exhibition area with exits tells the story of Cinerama. Cinerama camera number #1 is permanently exhibited. From the box office, not only tickets are for sale. Also a wide selection of sweets and sodas tempts the audience. 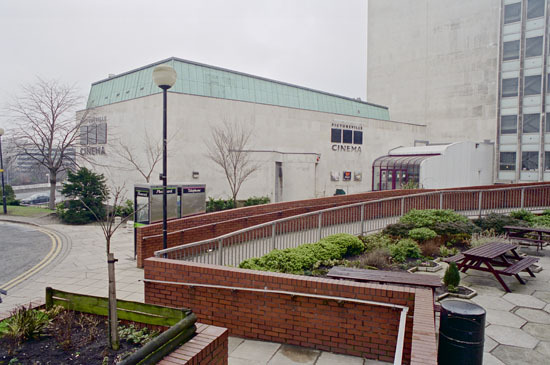 There are two entrances to the cinema on both sides of the B-projection room. Once inside this beautiful cinema, you find yourself "surrounded" by 306 seats, 3 projection rooms, JBL surround speakers and a large wide "Cinerama red" curtain. The colours are kept in black, grey and red. The seating area. Note Able projection to the left. 306 seats including 2 wheel chairs. The seating area is amphitheatrical and the view to the screen is unobstructed by the viewer in front of you. 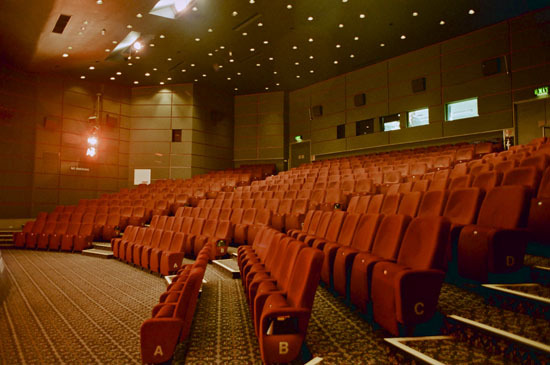 Row A is the first row nearest to the screen(s). There are 12 rows A through M (I is missing). The distance from row to row, however, is objectionable. The distance is very short and can be uncomfortable when viewing long films. Additionally when you have to move for late comers, you just have to stand up. An extra foot of leg space would have been great. But that is the only regret from this writer. In front of the screen(s) there is a small stage. The projection rooms are kept very clean. The Cinerama boxes Able and Charly, situated in opposite sides of the cinema are clearly visible from the auditoria. Inside there is an Cinemeccanica Victoria 8 Cinerama projector and a tower with the large reel of film. 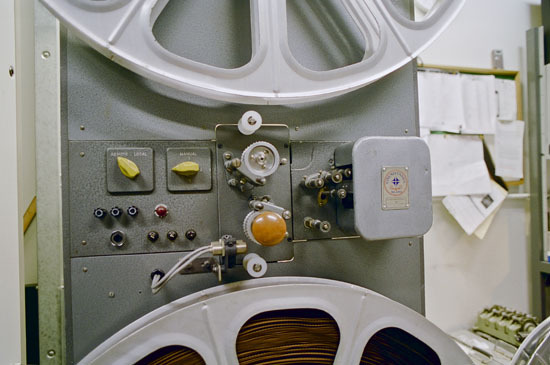 The centre box is also equipped with a 5-deck platter, a 35mm/70mm Cinemeccanica Victoria 8 projector and the third Cinerama projector Baker. The B Cinerama panel is not coming from a large 7000 ft reel like A and C panel, but from the platter. Perhaps the first time Cinerama has been shown on platters. The large Cinemeccanica Cinerama sound 35mm dubber with a new sound head manufactured by Teccon is also installed in Baker. The amplifiers are QSC of which there are 6. The sound system is a Dolby Laboratories model CP200 and the latest in digital technology is a SONY SDDS reader. The main speakers in the cinema are Electro Voice and the surrounds are JBL. The Cinerama screen from the rear, or actually from the left of the screen. Projectionists Mr. Tony Cutts and Mr. Duncan McGregor are seen through the screen. Note the deep curvature and louvers. The screen technology is very sophisticated. For ordinary film presentations a 10,2 meter flat roller screen is used. Behind the roller screen are 5 speakers for 5 channel sound reproduction. All ordinary presentations are shown on this screen. The unique feature of Pictureville is the screen behind the roller screen. Not only are two sets of projectors installed, but also two sets of screen/speakers and curtains. The giant curved 146 louvered Cinerama screen is revealed when the roller screen and speakers are hoisted into the ceiling. The roller screen is manually controlled from behind the screen. 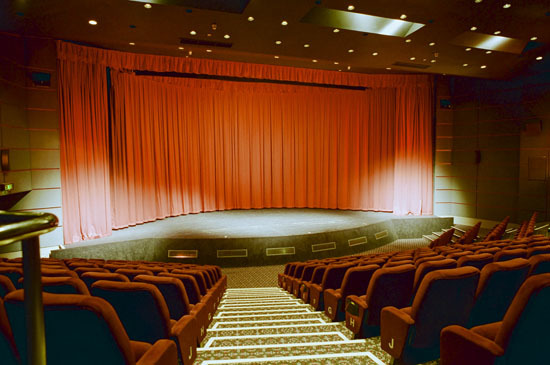 The Cinerama screen is made of 1360 guided louvers each angled to the audience and the relevant projector. It is designed to reduce cross reflection to a minimum. The screen measures 146 horizontally and 55 vertically. The aspect ratio is 2,62:1. The relative aspect ratio seen straight in front of the screen is 2,24:1 with a heavy butterfly effect because of the deep 146 curvature. 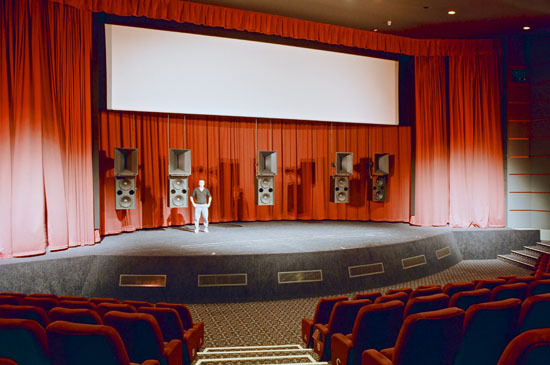 Behind the Cinerama screen 5 speakers are installed in a THX-like wall for discrete 7 channel Cinerama sound. The premiere of 3-strip Cinerama and re- release of "This is Cinerama" took place June 16, 1993. Present at that performance was the widow of Fred Waller, the inventor. "How The West Was Won" was shown March 9, and March 10, 1996 during the Wide Screen Festival. Additionally a work print of the new Kinopanorama film "Bounty" has been shown on the Cinerama screen in 3 strip. Next door to Pictureville cinema the NMPFT is running a museum and the only IMAX screen in the UK (until 1997.) 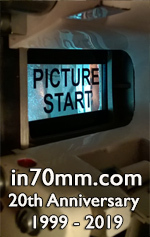 More info about IMAX and NMPFT in a future article in The 70mm Newsletter. Even though Pictureville is located well outside London it is very easy to reach. Out of many possible ways of getting to Bradford including walking, by car or flying, the train from London is the obvious choice. With departures every hour from Londons Kings Cross and a change in Leeds, the train ride takes 3 hours. You will arrive at Bradford City Centre Interchange, only 5 minutes by foot from Pictureville. Louvered 146° Cinerama screen. 15,6m (512") wide along the curve. 5,9m (195") high. Screen supplied by Hurley Screen, Inc., Baltimore, USA. Depth of curvature is 3,9m (1211"). Screen chord is 13,0m (428"). Throw to center of screen chord of Cinerama screen 18,1m (594"). There are 1360 louvers. Flat roller screen 10,2m (335") wide and 4,6m (152") tall from Harkness, Ltd, England. Both screens are covered by a "Cinerama Red" curtain. 3-Cinemeccanica Victoria 8 Cinerama projectors (Able, Baker & Charlie) electronically locked together by Selsyn motors. 1-Cinemeccanica Victoria 8 70/35 projector. 1-Philips DP70 Todd-AO projector (To be installed). Cinemeccanica CNR-5 70/35 non-rewind plattersystem with 5 decks. 3000 watt/110 amps Osram xenon on each Cinerama projector. 4500 watt /140 amps Osram xenon on the Victoria 8 70/35 (and the DP70 when installed). 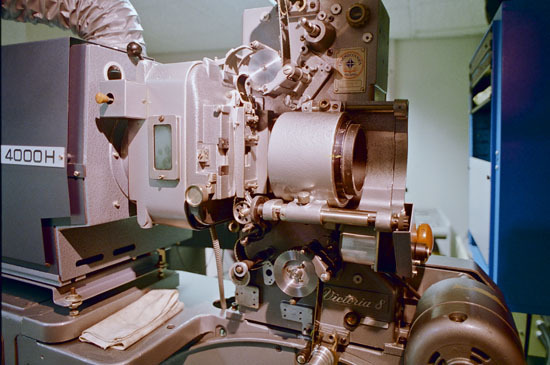 3-strip Cinerama is operated by two projectionists. Projection lenses are from Schneider and ISCO in Germany. Fixed lens on Baker. Zoom lenses on Able and Charlie. Focal length on lens for flat screen 70mm film is 85mm. Focal length for 70mm on Cinerama screen is 65mm. Roller screen, speakers and Mr. Duncan McGregor on stage to illustrate the size of the screen. 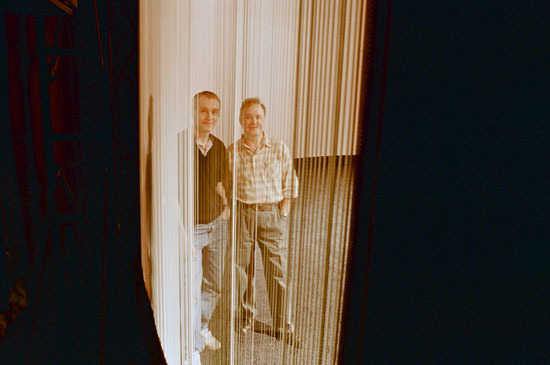 The Cinerama installation were done by Technical Cinerama consultants Willem Bouwmeester and John Harvey (The International Cinerama Society). All missing projector- and sound parts were collected from Helsinki, Finland (35mm dubber), Bruxelles, Belgium (louvered screen supports), Paris, France (handmade sprockets by Cinemateriel), Hollywood, USA ("This is Cinerama" negative and soundtrack restoration by PixFix), Sound Associates (London), Teccon Enterprises (Los Angeles), Milan, Italy (drawings supplied by Cinemeccanica). England and USA (louvered screen by Hurley Screen, Inc., Baltimore, USA. Flat screen by Harkness Screens). Cinemeccanica A6 Cinerama Sound 35mm dubber with specially made Teccon 7-track Cinerama head. Dolby Stereo CP200 cinema sound processor. Dolby MPU-1 (Magnetic sound). Dolby SRA5 Spectral Recording. Dolby DA20 Dolby Digital. Sony Dynamic Digital Sound DFP-D2000 processor (SDDS). Digital Theater Systems SDTS-6 processor (DTS). 10-JBL 8330-DK surround speakers (Surrounds will be upgraded soon). Electro Voice screen speakers. One set of 5 screen channels behind both screens. Amplifiers: 3-QSC USA 1300 (2x650 Watt) for screen speakers and 3-QSC USA 850 (2x425 watt) for subwoofer and surrounds.